Unless you're well off, you've probably experienced the hard liquor purchasing conundrum. You know the one: you want to stock your home bar with more than just one spirit, but you don't want to drop $100 or more just so you can have some variety in your alcohol cabinet. Thankfully it's very easy to handle that problem with just a few extra dollars. How? 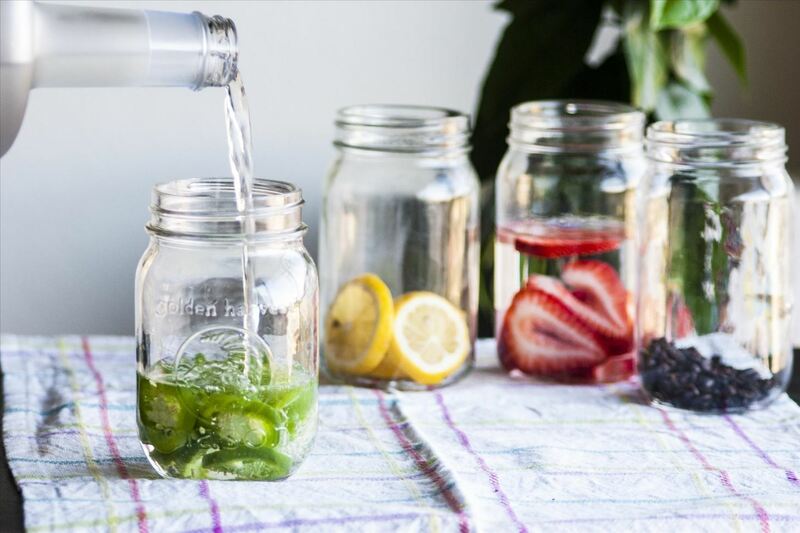 By infusing your alcohol. It's my go-to trick to make my home bar look a lot more impressive than it is: buy one bottle of alcohol, infuse it four ways (while still saving some untouched booze), and suddenly you go from having one alcoholic option to having five. Having options makes mixing drinks a lot more fun when you ask your friends what cocktails they want, and it keeps your daily nightcaps from getting too monotonous. Oh, and it's extremely easy. For this first step, the world is your oyster. If you're making small batches like I do, you can really play with flavors. That way if you don't like it, you're only wasting a few bucks worth of booze. 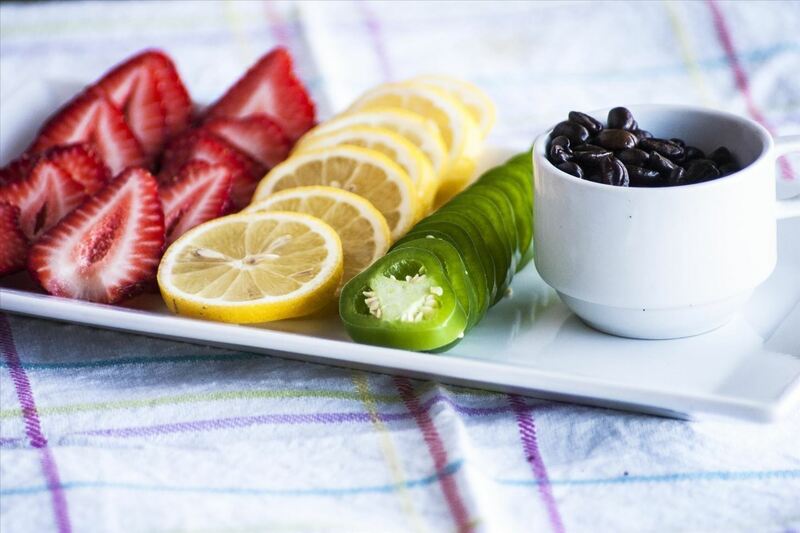 My favorite flavors are shown here: strawberry, lemon, jalapeño, and coffee. But you can also use herbs (which pair incredibly with citrus), aromatics such as ginger, or veggies such as cucumber (which is technically a fruit). Make sure you're cognizant of Step 2 when beginning Step 1: you want to find flavors that pair well with the alcohol you're using. If you need help, Edible Crafts has you covered for infusion pairings. After you've chosen your ingredient, simply chop it up (you can leave it whole if it's an herb, or slightly crush your coffee), and then add it to a glass jar. Technically you can infuse any spirit, but more complex alcohols like whiskey and rum are a lot harder to infuse and get good results. 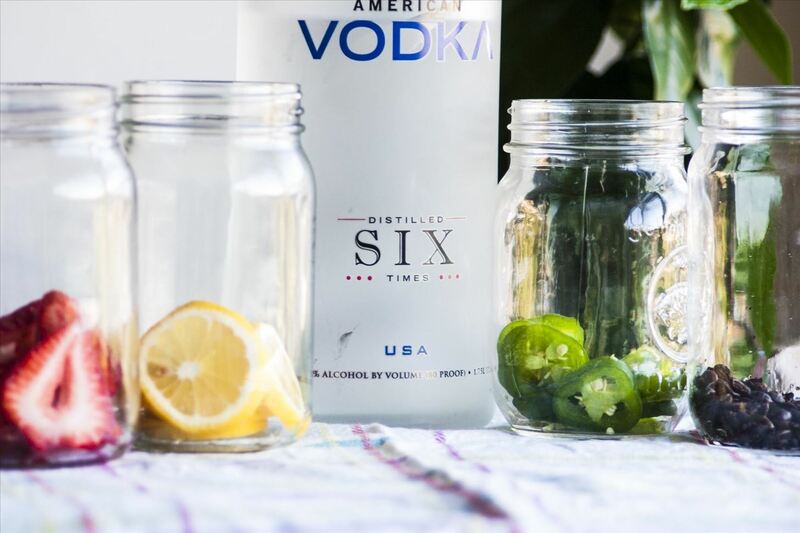 I highly recommend infusing vodka; partly because it's delicious, but mainly because it has a neutral enough flavor that allows you to infuse virtually any ingredient with success. 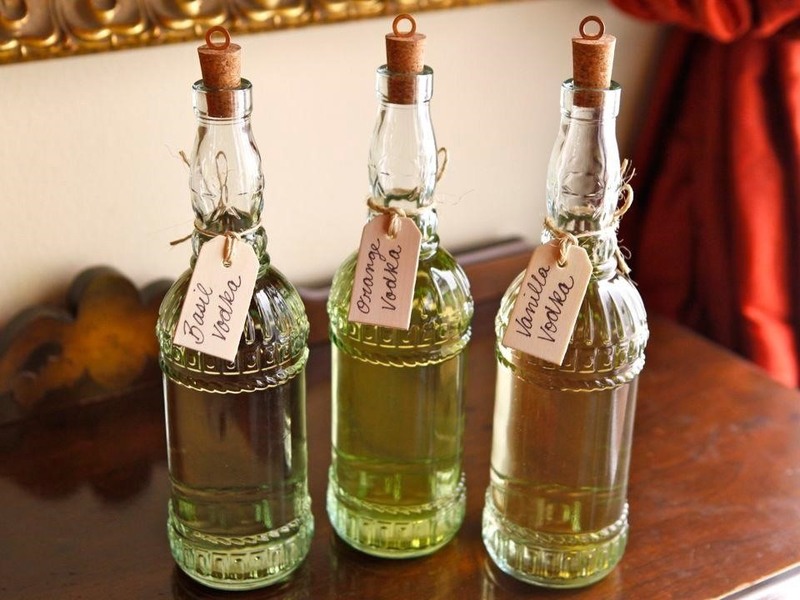 I also recommend going for a mid-level alcohol; the infusion will overpower the flavor of a top-shelf spirit, but you don't want to use really poor quality booze. There's no exact formula for booze-to-ingredient ratio. It depends on the ingredient, how strong you want the infusion, and for how long you let it steep. As a general rule I try to use between 1/4 and 1/6 as much flavoring as I do alcohol (by volume). 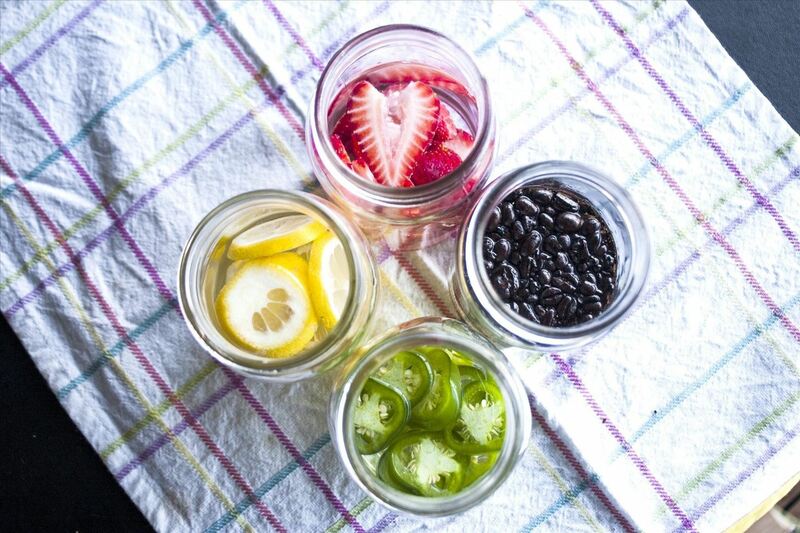 I recommend using glass containers with secure lids like Mason jars so there's no chance of plastic or metal tastes leaching into your infusions. After the booze is added, simply put a lid on it, and let it sit somewhere cool (you can leave it out at room temperature, just not in direct sunlight). This is the step that is most frequently messed up when dealing with alcohol infusions. While certain fruits can infuse for months on end without having foul effects (my sister often forgets about her alcohol infusions, only to find them a year or two later—and they taste incredible), others are less forgiving. Leave a jalapeño infusion for too long, and you'll have an inedible alcoholic hot sauce on your hands. Let vodka steep with coffee longer than you should and you'll have something with stomach-churning acidity. Most infusions only need a few days, but if you really want to play it safe, you'll begin to get a subtle flavor after just a few hours. My advice, however, would be to just keep an eye on your infusions: smell or sample them every day, until they taste like you want them to. That said, if you don't feel like steeping your booze, you can get really impressive by using hot liquid and cooling with dry ice for an instant infusion. After the alcohol has steeped long enough, it's time to strain it. I recommend straining through a cheesecloth or a coffee filter, as the infused ingredients usually leave behind a residue that won't be strained out with a kitchen strainer. I recommend using these infusions for martinis and vodka tonics, or for pairing with an herbaceous simple syrup. Now that you know about infusions, it's time to learn more about Skittles shots. If you're low on cash, here's how to turn your favorite fruit juice into hooch. Everybody should cook more with booze, don't you think?